The Factory shirtdress wouldn’t be my 1st choice to pair the necklace with, but I like it with the navy. The dress is a lil 50s. The necklace, not really. I ended up not keeping the dress because I didn’t feel like it fit with my style statement this year. I’m all about the sweatshirts & cargos for one of my main looks. 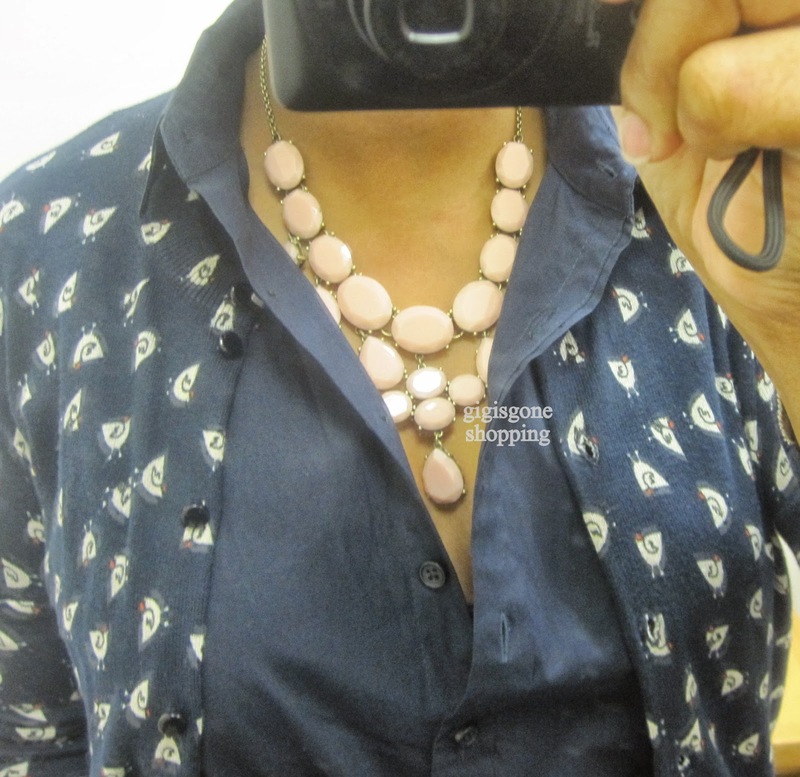 This necklace isn’t my personal style, but I think it’s a piece they did well for Factory. The weight & stone quality are there. Sometimes the Factory pieces feel chintzy. I give this one a thumbs up. 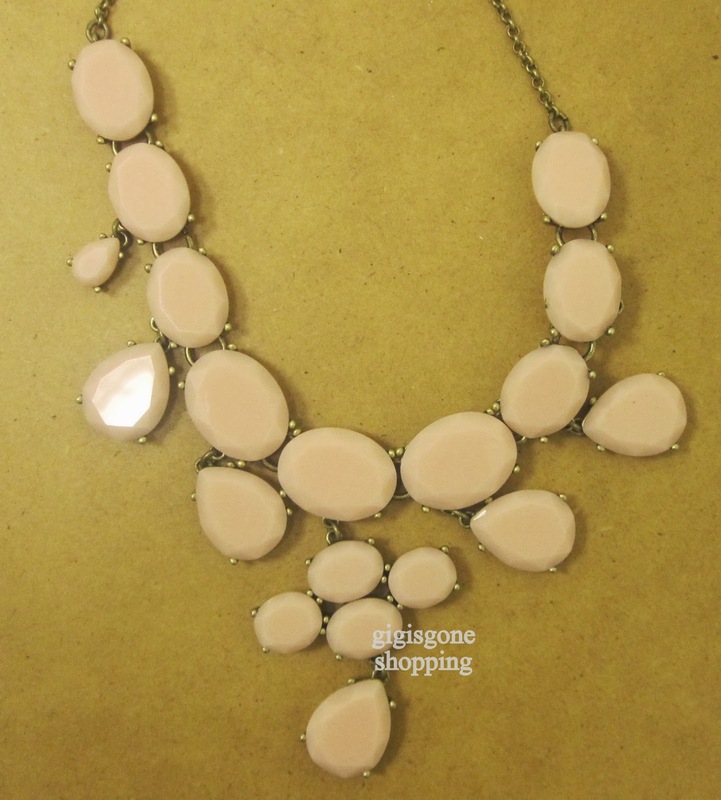 Factory dangling jewels necklace (06176, $64.50) – Only the dusty orchid available online. I think some stores still have the peach color. It was pretty on. I like the color. Another one where the stone weight & quality don’t feel chintzy. Remember that the Factory clothing, shoe & accessy colors work well with retail clothing, shoes & accessories. Thumbs up. I love the grey, mint & crystal. The green punches it up, too. Thumbs up. 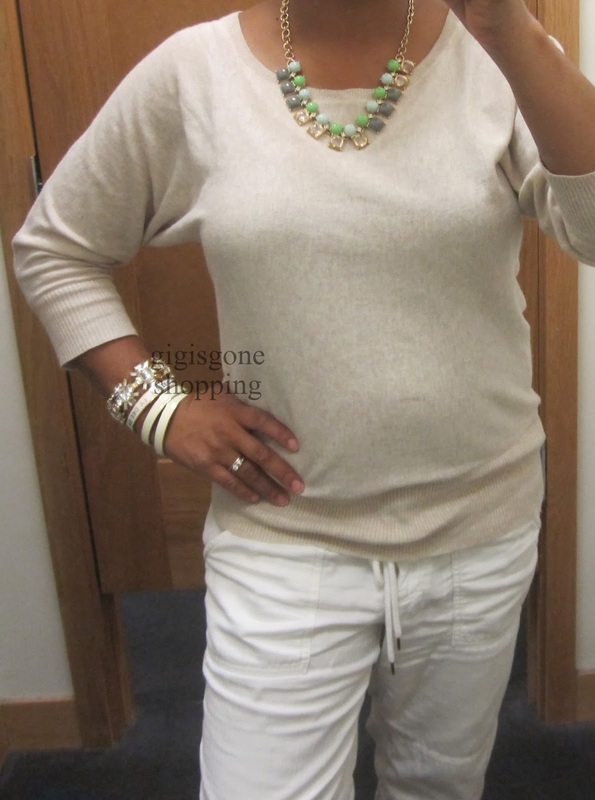 Another great color mix that would go well w/other J Crew clothing. I think the necklace could be layered with at least another one for an interesting effect. Factory crystal candy necklace – I thought I had pics of this one. I guess not. It’s my current favorite that’s in-store right now. 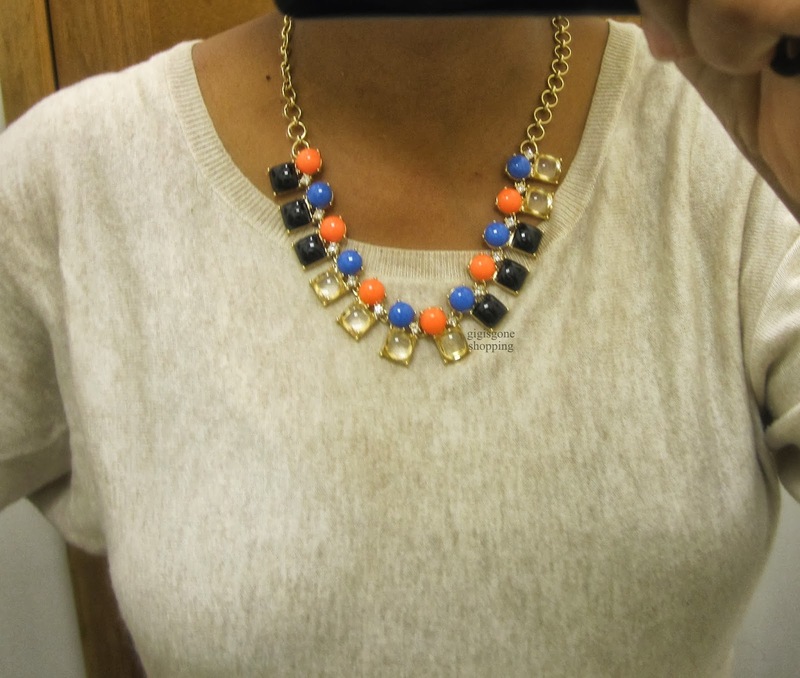 I have a J Crew Factory necklace with similar-ish colors. So far I’ve had self control enough to pass, but if I get another chance to buy it on a good promo I just might do it. Terms have changed. There are new exclusions, i.e. coats. So read the legalese if the discount isn’t working on some of your items. Will not be stackable w/student/educator discount. 50% off your purchase in-store & online, priced as marked. Not stackable with outlet coupon or other coupons, in-store. Right after study some of the weblog posts on your website now, and I truly like your way of blogging. I bookmarked it to my bookmark web site list and will likely be checking back soon. Pls take a look at my web site at the same time and let me know what you feel. F*ckin’ amazing issues here. I am very satisfied to peer your post. Thanks a lot and i am looking ahead to contact you. Will you kindly drop me a e-mail? Along with every little thing which appears to be developing inside this particular area, many of your viewpoints are actually quite exciting. Even so, I appologize, because I do not subscribe to your entire theory, all be it stimulating none the less. It would seem to me that your comments are actually not totally justified and in fact you are yourself not really totally confident of your assertion. In any case I did take pleasure in reading through it. Awesome blog! Do you have any tips for aspiring writers? I’m hoping to start my own blog soon but I’m a little lost on everything. Would you advise starting with a free platform like WordPress or go for a paid option? There are so many choices out there that I’m completely confused .. Any tips? Thanks a lot! I just want to tell you that I am just new to weblog and really savored this web blog. Probably I’m planning to bookmark your blog post . You amazingly have exceptional stories. With thanks for sharing with us your web site. I just want to mention I am all new to blogging and site-building and truly loved this page. Probably I’m planning to bookmark your blog . You actually have awesome articles. Thanks a lot for sharing with us your web page. I simply want to tell you that I am just beginner to blogs and truly loved your blog site. Likely I’m likely to bookmark your website . You actually come with beneficial posts. Thank you for sharing with us your webpage. I simply want to say I am just very new to blogs and seriously savored this page. Likely I’m planning to bookmark your blog post . You surely have terrific articles. Regards for revealing your website. I just want to mention I am just all new to blogging and actually enjoyed this web blog. Most likely I’m likely to bookmark your blog post . You certainly have fantastic articles and reviews. Bless you for sharing your blog site. I just want to tell you that I’m all new to blogs and absolutely savored you’re web page. Almost certainly I’m going to bookmark your website . You amazingly come with good well written articles. Thanks a lot for sharing with us your blog. Excellent website. Plenty of helpful info here. I am sending it to some buddies ans additionally sharing in delicious. And of course, thank you to your effort! I simply want to tell you that I am newbie to blogging and site-building and absolutely liked this web site. Probably I’m going to bookmark your site . You actually come with terrific well written articles. Kudos for sharing your web site. I simply want to tell you that I’m newbie to blogging and site-building and certainly liked you’re website. Likely I’m planning to bookmark your website . You really have really good stories. With thanks for sharing with us your web site. Its like you learn my mind! You seem to grasp a lot about this, like you wrote the e-book in it or something. I think that you could do with a few p.c. to force the message home a bit, but instead of that, that is magnificent blog. A great read. I will definitely be back. Whats Taking place i am new to this, I stumbled upon this I’ve discovered It absolutely helpful and it has aided me out loads. I hope to give a contribution & assist different customers like its aided me. Good job. Thank you for all your valuable work on this web page. Kim take interest in setting aside time for research and it is easy to see why. Most of us notice all relating to the dynamic tactic you present very useful suggestions through the blog and therefore strongly encourage participation from other individuals on this situation so my princess is now discovering so much. Have fun with the remaining portion of the year. Your conducting a powerful job. Thank you for any other informative site. Where else may just I get that kind of information written in such an ideal method? I have a mission that I’m simply now running on, and I have been at the glance out for such info. Wow, wonderful weblog format! How lengthy have you been running a blog for? you made blogging look easy. The entire look of your site is fantastic, as well as the content! Excellent post. I was checking continuously this blog and I’m impressed! Very helpful info specifically the last part 🙂 I care for such information a lot. I was looking for this certain information for a long time. Thank you and best of luck. Real fantastic information can be found on site . “We should be eternally vigilant against attempts to check the expression of opinions that we loathe.” by Oliver Wendell Holmes. Thank you for every other excellent article. Where else may just anyone get that type of info in such an ideal approach of writing? I have a presentation subsequent week, and I’m on the search for such information. This is the perfect website for everyone who would like to find out about this topic. You realize so much its almost tough to argue with you (not that I personally will need to…HaHa). You definitely put a brand new spin on a subject which has been written about for ages. Wonderful stuff, just great! A fascinating discussion is worth comment. I do believe that you need to publish more about this subject, it may not be a taboo matter but typically folks don’t talk about these issues. To the next! Many thanks!! But wanna comment that you have a very decent website , I like the design and style it actually stands out. I¡¦m no longer certain the place you’re getting your information, but good topic. I needs to spend a while finding out much more or understanding more. Thanks for wonderful information I used to be in search of this information for my mission. Some truly nice and useful information on this website, too I believe the style holds good features.